We want to make sure that you can always respond to your customers. 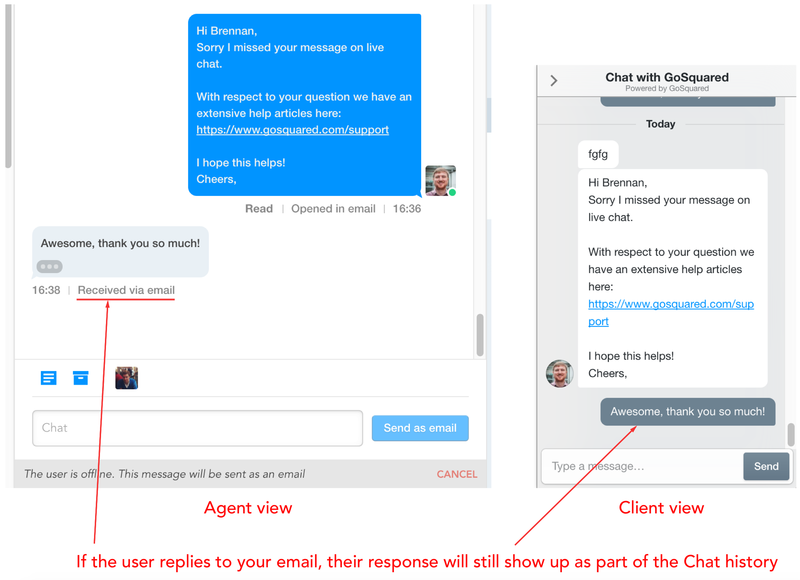 This feature means that if a user goes offline before you have a chance to respond – your Chat messages can now be sent via email (assuming the user has left their email address). When the user comes back online (either on your website or within your app), they will be able to see their whole message history in one feed, regardless of whether those messages were sent over email or via Live Chat. Note: this feature is for personal 1–1​ messages sent from your GoSquared Inbox. Broadcast messages are not currently sent via email. When a user goes offline (leaves your website), the message composer will automatically switch to 'email mode'. This means that your message will get delivered via email and it will still form part of the conversation history. Any replies to your email will also come directly back into Inbox. In email mode, you can use the 'Enter' key to create new lines. The 'Send via Email' option will only be available if the user has an email address. Note: You can opt out of Email mode if you'd prefer to only send your message via Assistant. If you do toggle 'Send via Email' off, this setting will only be remembered until you navigate away from the conversation. GoSquared will automatically generate the rest of the email template for you, including the email subject line and email's signature/footer. Who is the email sent from? This can only be set once. It will be unique to your GoSquared project so that no other GoSquared customer can claim it. Once set, it cannot be changed or removed. Currently you can only customise the domain using a-z characters (no numbers or dashes etc) and it can only be up to 16 characters long. Note: only the project owner can set the custom domain. The project owner can set this from Settings > Current Project > Assistant. What happens if a user replies to your email? 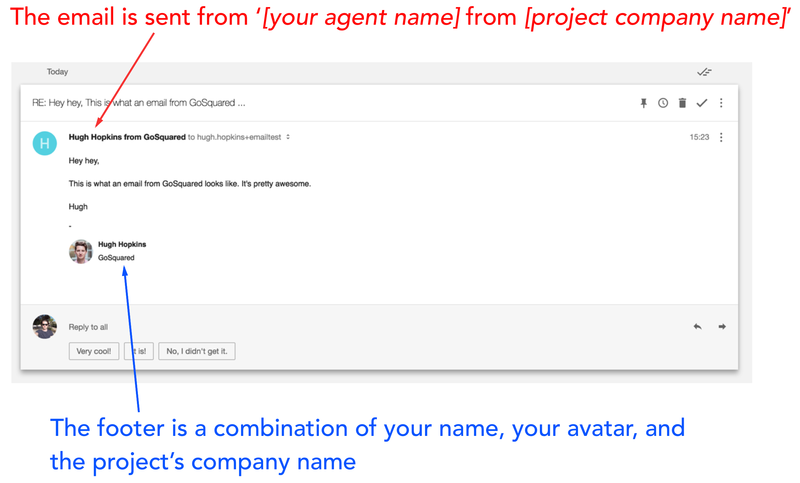 When a user replies it will show up in your GoSquared Inbox as a new message. You will still get push notifications of new messages regardless if the user replied by email or via Live Chat.